Global Reinsurance’s tailored sponsorship packages raise the profile of your brand, products and thought leadership expertise to an international audience of senior insurance executives attending the event or following GR’s exclusive coverage. 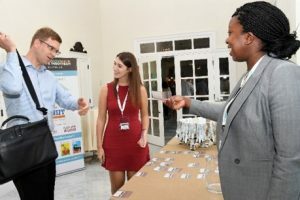 Bermuda Innovation & InsurTech will deliver an audience of more than 150 attendees actively engaging in the transformation of the re/insurance sector through innovation and technology. DO DELEGATES PAY TO ATTEND? To deliver this targeted, senior audience Global Reinsurance will invite a specially selected group of senior insurance/reinsurance executives to attend the event as VIPs. All other attendees will be required to pay a delegate fee that includes full access to the business conference and networking events. All our start-ups have exclusive exhibition space, allowing you to take a closer look at the technologies that could shape the way you do and run your business moving forward.